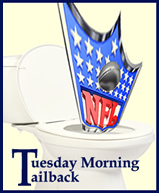 I wrote my first ever Tuesday Morning Tailback article on Tuesday, December 21, 2010 called Fly Eagles Fly, which mocked the over-the-top media adoration of the Philadelphia Eagles and quarterback Michael Vick after a dramatic late season comeback against the New York Giants. At that moment, the Eagles were considered the “clear favorite” in the NFC but they promptly went on to lose three straight home games (including the wildcard playoff game) and an early exit from that season. This was something I predicted at the time and proudly gloat about now. It was also “Exhibit A” on out-of-control media hype, as many jumped on the Michael Vick redemption bandwagon. 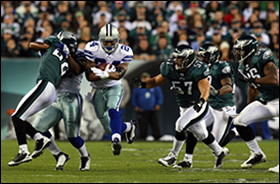 Other 3 teams in the NFC East – 12 Super Bowl victories, Philadelphia Eagles – zero. Naturally, this season has been another disastrous one for the Eagles. With a record of 3-6, tied for the worst in the entire conference, and a current 5-game losing streak, it may be over for Vick and longtime head coach Andy Reid, and the team overall looks to be heading back to rebuilding phase one. Does anyone have a nickname for that?